The 737 MAX incorporates the latest technology CFM International LEAP-1B engines, Advanced Technology winglets and other improvements to deliver the highest efficiency, reliability and passenger comfort in the single-aisle market. The 737 MAX will be 14 percent more fuel-efficient than today’s most efficient Next-Generation 737s – and 20 percent better than the original Next-Generation 737s when they first entered service. The 737 MAX has a total of 2,294 orders from 47 customers worldwide. 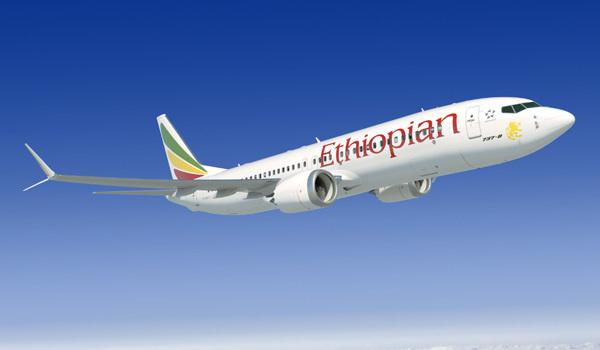 Ethiopian currently serves more than 83 destinations across five continents from its base at Bole International Airport in the Ethiopian capital, Addis Ababa. The Ethiopian flag carrier’s partnership with Boeing has existed for more than half a century, with a current fleet of more than 50 Boeing airplanes that includes Next-Generation 737s, 757s, 767s, 777s, 787 Dreamliners and a cargo fleet of 757s, 777 Freighters and MD-11s.